born in Paderborn / Germany Art studies at the University of Paderborn / Germany International contemporary master Certified artist of the Museum of the Americas, Miami Paintings in museum collections USA International awards and publications Global Art Award for Abstract Art, Dubai, November 2017 Independent artist since 1991 International exhibitions and art fairs in Miami, New York, Las Vegas, Houston, Dallas, Tokyo, Singapore, Santa Fe, Dubai, London, Ankara, Istanbul, Vienna, Basel, Berlin, Madrid, Barcelona, Paris, Montreux etc. "My pictures are like sculptures; thick color applications break the frame. The works are expressive, colorful, modern, animating, impulsive, full of vitality and happiness. " Erica Fromme Textile, vivid works that reflect a passionate palette of vivid pigment and form explosions is the calling card of German-born artist Erica Fromme. Using oil and acrylic paints freely on canvas, Erica uses color to communicate with her mind as she pervades her creations with warmth and timelessness. 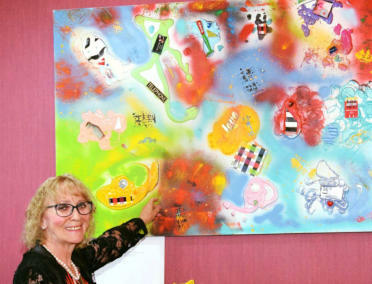 She hopes that her artwork will give the viewer positive energy. Erica earned a master's degree in Contemporary Art in Dubai in November 2017 and the Global Art Award for Abstract Art. After a three-year stay at the South Florida Art Center, Miami Beach, Florida, Erica has been a freelance painter since 1991. Her large format, colorful and expressive images have been exhibited both internationally and nationally, and her works are prized in both private and public collections. Her "Huetopian paintings" resonate strongly in the mind of the beholder. Erica is expressive in brushwork and pure, electric color. Erica is inspired by the abstract expressionists. 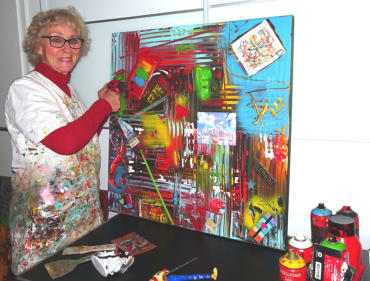 Her new images have their own style between Pop Art, Street Art and Abstract Art. She integrates a unique mix of materials into her images. Erica Fromme has been shown internationally in Germany, America, Spain, Japan, France and other countries.